In this tutorial we'll start building a blockchain raffle on Ethereum. What is gas and how are Ethereum transaction costs calculated? Provably fair games are games with an element of randomness but with mathematically provable odds. In other words, there must not be a way for the house to change the odds or the outcome between the time the bet was made and the time the bet was realized. You can read more about provably fair games in this post. Apart from a coin toss, the most straightforward example of gambling is probably a raffle. Let's build one to give away two tickets to Blocksplit, a blockchain developer conference in Split, Croatia. Due to the simplicity of this project and the approachable nature of coding in the browser, we'll be using the Remix tool – an in-browser Ethereum programming environment. Note: with more serious projects, it's recommended to run your own blockchain and isolated testing environment. Read this post and this post to find out how to do that. 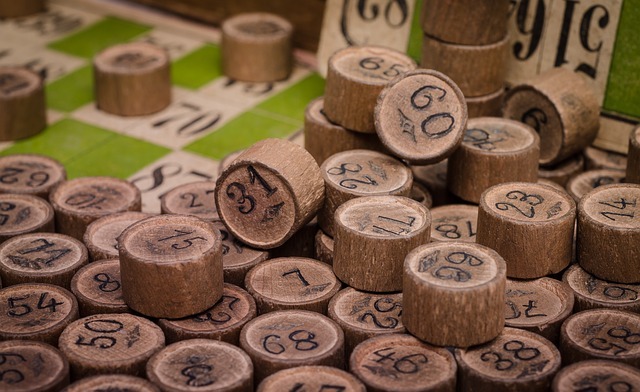 A raffle is an example simple enough to be understandable even without an in-depth knowledge of Solidity, and every line we mention will be explained in detail in both this post and its followup. It's our recommendation that you follow along with this tutorial by typing in the same code – that's the best way to learn and remember things and will let you play with your own variations later on. To open a new file in the Remix editor, click the top left New file icon. The file name is arbitrary. Let's call it Blocksplit.sol. After confirming a new empty file tab will open. The first line of every Solidity project is the pragma declaration. This means “I'm writing this code with Solidity version 0.4.20 or higher”. If you're not sure which version is latest when writing your own code, find out here. The body of every smart contract (i.e. the part that contains the application logic) must be between curly braces. This includes both variables (also known as properties) and possible functions we might be calling on later. Let's declare some variables within those curly braces. First, we need a way to save all raffle participants. A list is ideal for something like that. This means “a list of addresses named players”. address is a type of data in Solidity and can hold a literal address of the Ethereum blockchain, whether it's an individual user's address, or an address on which a smart contract lives. Brackets () added after a data type look and act like a box. In other words, type means “a box into which I can put one or more values of type type“. Note: some other types in Solidity are uint, string, bool, address, etc. We also need a way to save the unique players – we don't want a player to be able to participate in the game multiple times from the same address. Let's declare a new variable for that. x is 1, y is 200, z is 234121. How can this possibly help us determine uniqueness of players? How we'll use this mapping will be revealed in the next section. We also need a variable which will save the winners when it's time to make the draw, and we need a variable into which we'll save the address to which the funds are going to get sent when the raffle is finished. In this case, that's going to be the Mining For Charity address because we're giving all the profits away. Although there's no logic in this contract yet, we can still test it. This JS simulation, however, lets us test out our contract's basics. Our contract is now deployed on this test blockchain, but it's useless – we can't do anything with it. What if, for transparency's sake, we want to make it possible for outsiders to read the address to which the funds are going to be sent after the raffle is done? If we append the public visibility modifier to variables, a function which allows external parties to inspect that variable's value will automatically be generated on deployment. Such a function is called a getter because it serves a single purpose: getting a value. Let's add public to all our variables, just before their names. Now if we redeploy, we'll have some blue buttons accessible under the contract's deployed name. Clicking any of them will output the values saved inside them. Currently, only our charity variable has a value because we explicitly defined it in the code. Note: in Remix, blue buttons mean reading from the blockchain, an action which is always free. Red buttons mean writing to the blockchain, an action which will always cost gas because it requires a transaction. To let a smart contract accept payments, the function which accepts them needs to be declared as payable. But what if we want someone to be able to participate in the raffle by just sending ether to the address of the raffle, without complicating their life with custom functions? A fallback function is a nameless function, so its declaration starts with function(). The word external means that it can only be called from outside the contract, not inside by other functions. The word payable is important here because it makes it possible for the function to process ether payments. The body of the function calls another function called play and passes it a parameter: msg.sender. What this means will be revealed in the next section. Our participants will be able to enter the raffle by either sending money directly to the raffle's address, or by calling the function play and providing an address which they wish to enter. That means, yes, they can also enter other people into the game through a function argument. Let's define it. Our function is called play and it needs one argument of type address we've arbitrarily called _participant. Putting _ at the front of argument names is just convention in order to differentiate them from the function's own arguments. The function is payable which means it can accept transactions with ether attached, and it's public which means it can be called from both inside the contract like the fallback function does, and outside it – from another contract or a wallet interface like MyEtherWallet. Next up we need to do some sanity checks before we let the player enter the game. The first check is making sure the amount of ether is sufficient – between 0.001 ether and 0.1 ether. In Solidity, the amount of ether is represented as its lowest possible unit: Wei. To get the ether amount from wei, we divide the number by 1018, or use a converter like this one. msg.value is the amount of ether that was sent with the transaction, and msg is the transaction itself - a global variable accessible throughout the whole contract. It will have the sender property, as seen in the fallback function above, and the value property, indicating how much ether was sent along with it. require means "If this requirement is not met, exit the program and reject the transaction". In other words: "Unless the transaction contains an amount of ether bigger than or equal to 0.001 ether, or less than or equal to 0.1 ether, cancel this action". && means and, so both conditions need to be true. Note: named units of ether and time are also available in Solidity. 1 ether is equivalent to 1000000000000000000, etc. The same goes for time: 1 minutes is 60, 2 hours is 7200, etc. The second check makes sure the player isn't already in the game. Every mapping is infinitely generated in advance. You can check every address' value in this mapping even if it has never been added to the contract because the default is assumed to be false. The == sign is used to check equality. = is used for assignment, so it's no good here - it would mean "make the left value equal to the right", which is not what we want. Why didn't we check for existing participation with a loop through all added players, exiting if the player is found? Loops are expensive. We could have written a for loop that loops through all the players added so far and exits the program if a duplicate is found, but as we explained in our gas guide, that's expensive and better done outside the smart contract or not at all. The mapping + list combination is perfectly sufficient in this case and at the same time helps wallets like MyEtherWallet estimate the gas cost for the transaction. We have two red functions - fallback and play. Those are writing functions (they change the blockchain's state) and need a transaction, which means they cost money to execute. Let's use fallback to send money directly to the contract. First, in the menu above under Value we need to put a number between 0.001 and 0.1. Then, the value unit (menu to the right of Value) needs to be put to Ether. Finally, we click the fallback red button. If all went well, clicking the blue players button should display the address from which we just executed the transaction. If we try to execute this same procedure again, the grey part of the screen will throw out a warning. The transaction will fail because this player is already in the game. Once we reach number 5, the program will start to output errors because there's only 5 players in the game (0, 1, 2, 3, 4, 5). 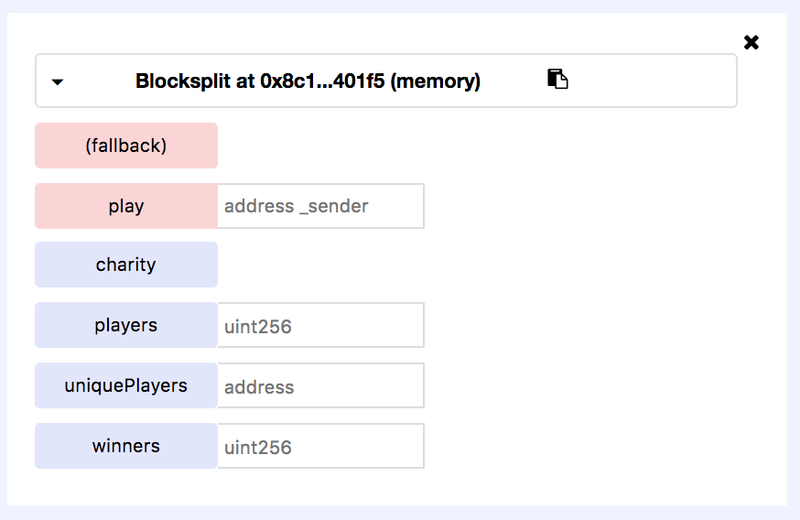 In this part, we started building a raffle for the Blocksplit conference. We went through the basics of smart contract structure, through variables, and some basic functions. We also learned how to accept payments in a smart contract and how to simulate transactions in the browser. In the next part we'll complete the raffle by adding a draw function to draw the winners, by polishing the code, and by deploying the contract to the live Ethereum network. Thanks! Just getting into Solidity development, and this was one of the use-cases I was interested in.